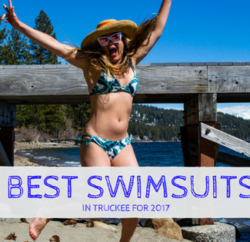 For the woman who wants to play in the sun all day long, Tahoe Mountain Sports has the collection of summer bikinis and athletic swimwear for you. Our bikinis and swimsuits fit in all the right places, feature bright colors and floral prints and look good on a range of body types. Our summer swimwear is designed to support your body and keep up with you for any adventure, be it on a backpacking trip to a High Sierra lake or a surf session on the California coast. Carve Designs, Lole and Next by Athena are three of our favorite brands. Each celebrates the healthy woman who spends her free time outside. Here’s a closer look at what these three companies are all about when it comes to bikinis and the sunshine. Tired of functional clothing that didn’t fit right, the two women surfers behind Carve Designs set out in 2003 to make their own apparel that would fit well and would be “functional, feminine and flattering.” Their experience shows. Today, Carve Designs is all about California swimwear and surfing. Carve’s summer bikinis feature a range of styles from bottoms and tops with thicker strings to tankinis with cinched ties at the hips to one pieces with plunging neck lines. The bottoms cover up and stay put. The colors in this year’s line are inspired by coral pinks, muted greens and sea blues. While Santa Cruz-based Carve Designs is all about the surf, we love the functional, athletic design for our adventures around Lake Tahoe, be it paddle boarding, kayaking or hiking around the Basin. Born in 2002 in Montreal, Lole embraces a philosophy of well-being and builds clothing that is technical, versatile and responds to the demands of the active, urban woman. Lole wants women to feel good in their clothing — even in a bikini. Which is why they pay attention to a cut that fits well but flatters, and stays put when you want to jump off the pier into the deep end. The Lole woman is active every day and has a never-ending curiosity for things outdoors. She loves and appreciates her surrounding environment and embraces her innate femininity. Lole strives to use renewable resources and recyclable materials to build its clothing, including organically grown and processed cotton and polyester fiber made from recycled plastic bottles. If you’re a woman who wakes up in the morning, grabs a cup of coffee, runs out the door and doesn’t stop between yoga classes, stand-up paddle board sessions, and soccer practice with the kids, until a glass of vino at a barbecue with friends and family that night, then Next by Athena is your brand. Next by Athena swimsuits are designed for active women who are on the go. The Southern California-based company offers an array of sporty swimsuits all built with NextFlex, a quick-dry material to ease the move from the pool to the grocery store. From supportive tops and tankinis with built-in sports bras, Next bikinis are transitional pieces. This year’s collection features teals and nautical hues, as well as richer purples, blacks, and pinks, with floral and paisley prints. Previous PostA Daylong Mini-Epic: Climbing the regular northwest face of Half Dome Next PostMark the Calendar for Ladies Night!